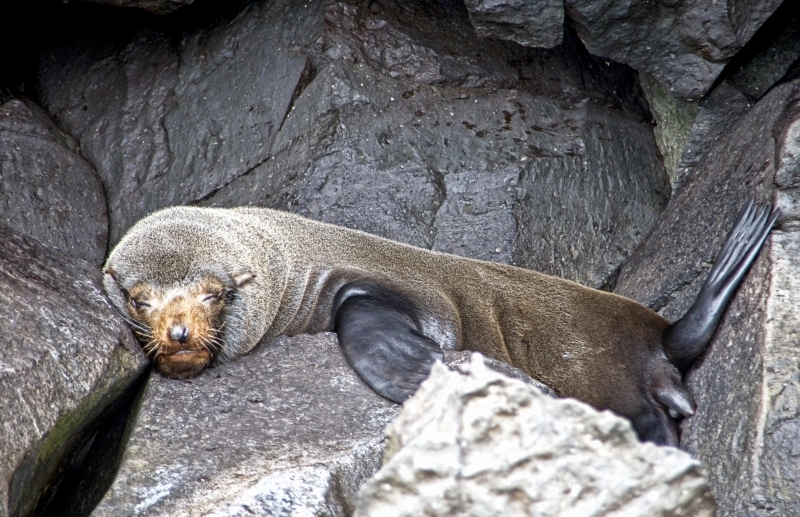 Galápagos Fur Seals are gray-brown above and lighter brown below. 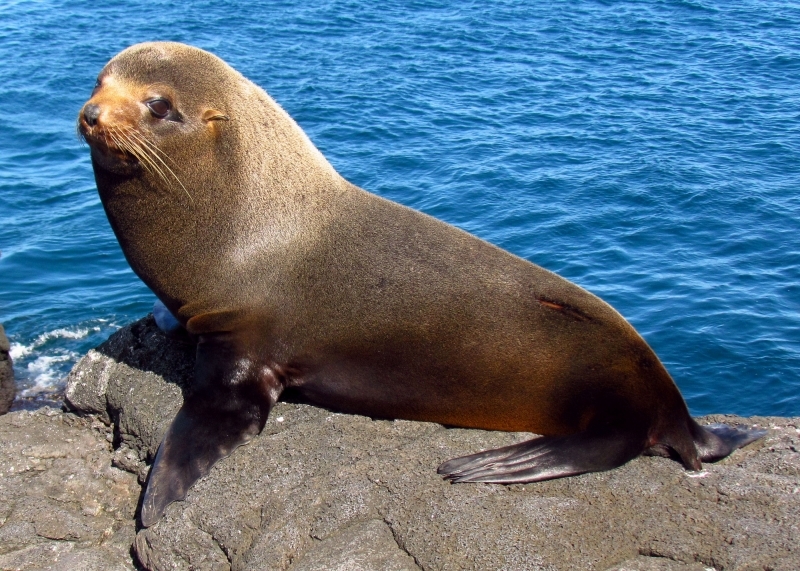 Adult males measure up to 1.5 meters long & weigh 64 kilograms on average. 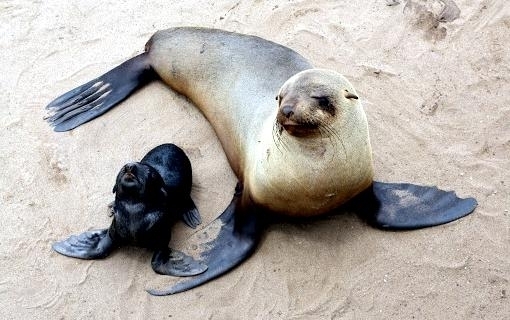 Adult females are smaller, measuring an average of 1.2 meters in length and weighing from 22-34 kilograms (average 28 kilograms). 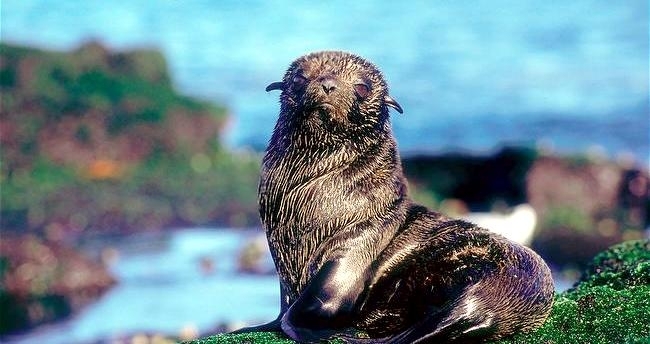 These seals are the most land-loving seals of the family Otariidae spending only about 70% of their life in the water. 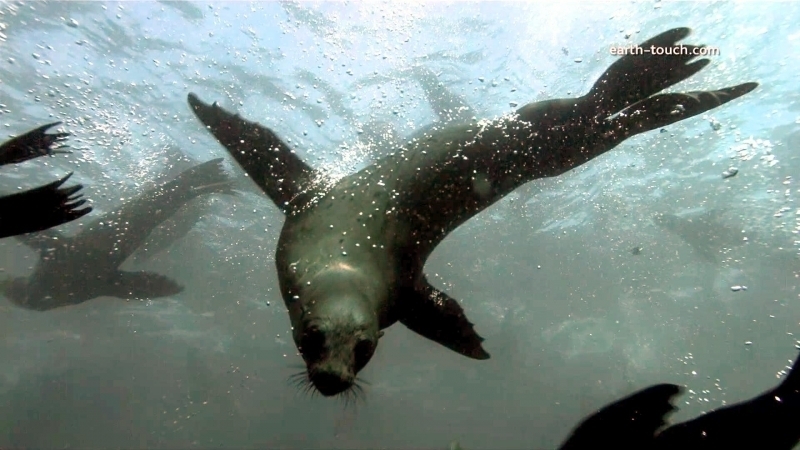 Nevertheless, they are still deep divers; females have been observed diving to a maximum depth of 15.4 meters for 6.5 minutes. 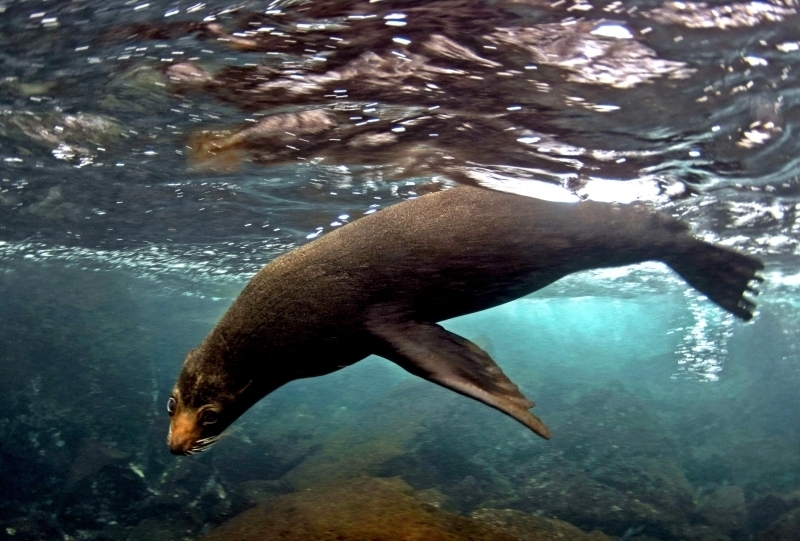 On average, females dive for about 16.4 hours to depths of no more than 30 meters at night when foraging for food. 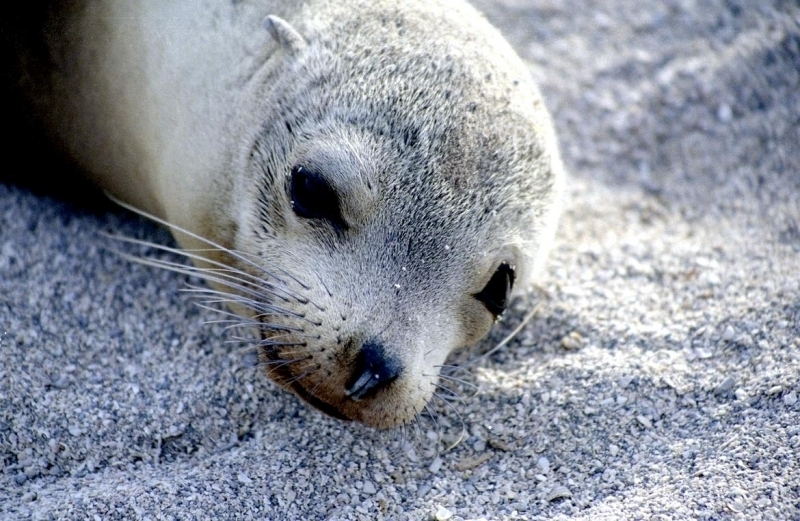 During the warm months, females spend 4-6 days in the water foraging for food and 1 day on land. 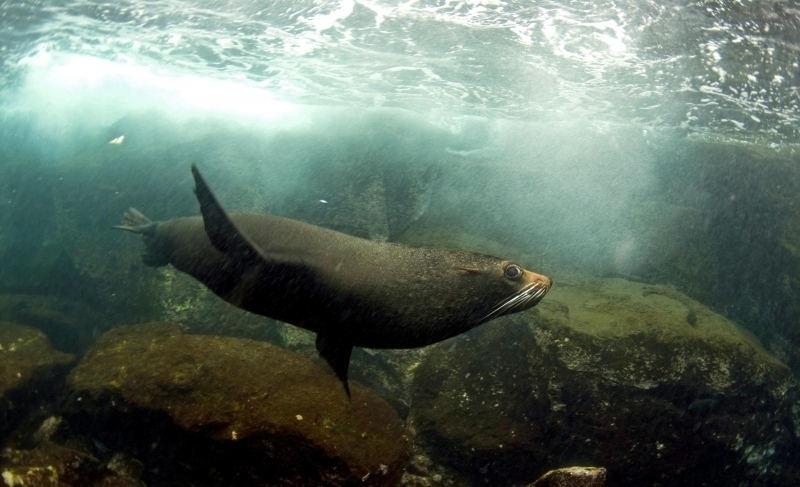 Adult male Galápagos Fur Seals are very territorial defending territories that can extend 200 square meters. 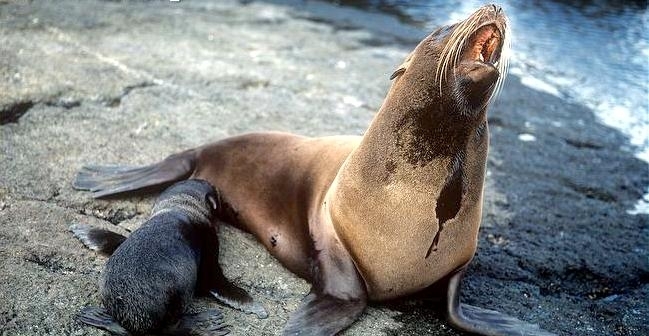 They will not abandon their territories to eat until all of their stored energy has been depleted. 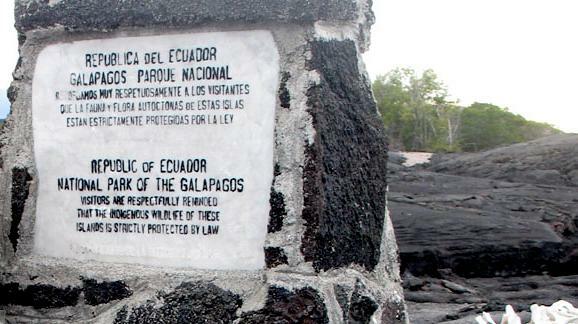 Approximately 30% of males die in territory fights annually. 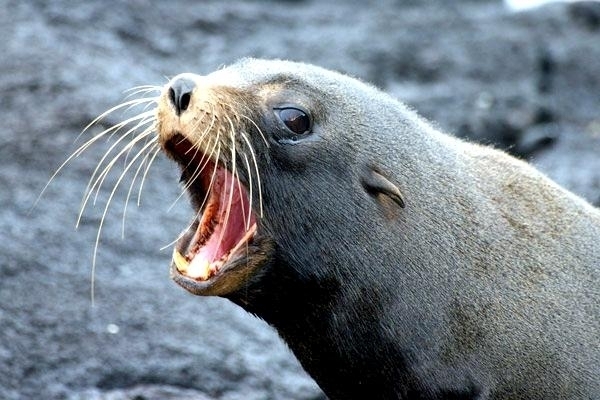 Females also defend territories which are about half the size of male territories. 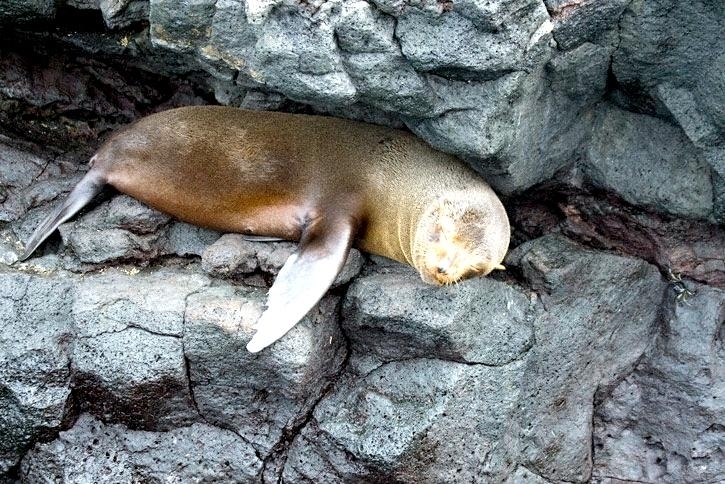 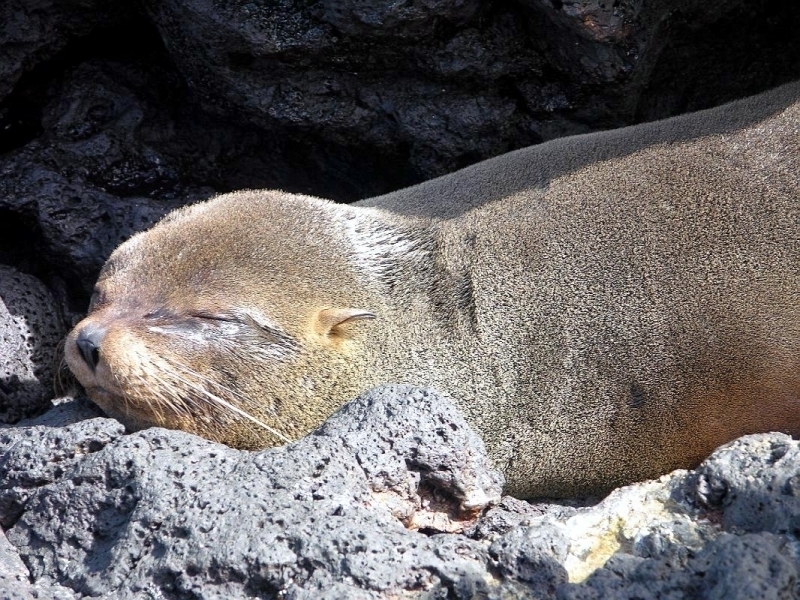 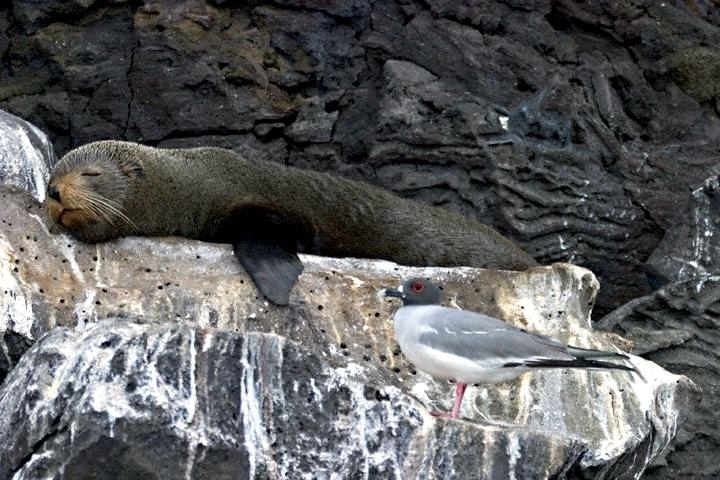 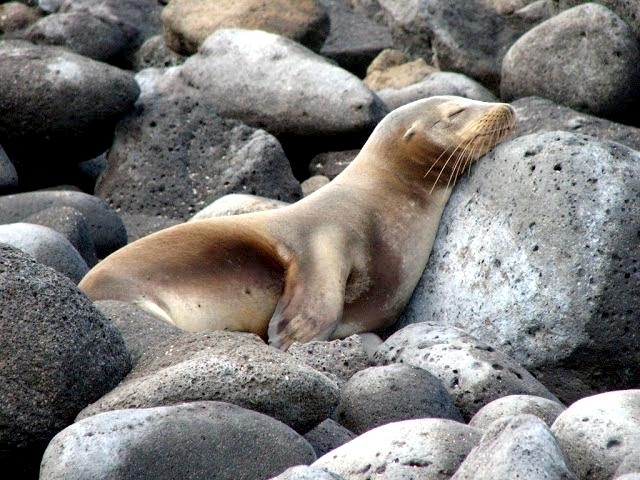 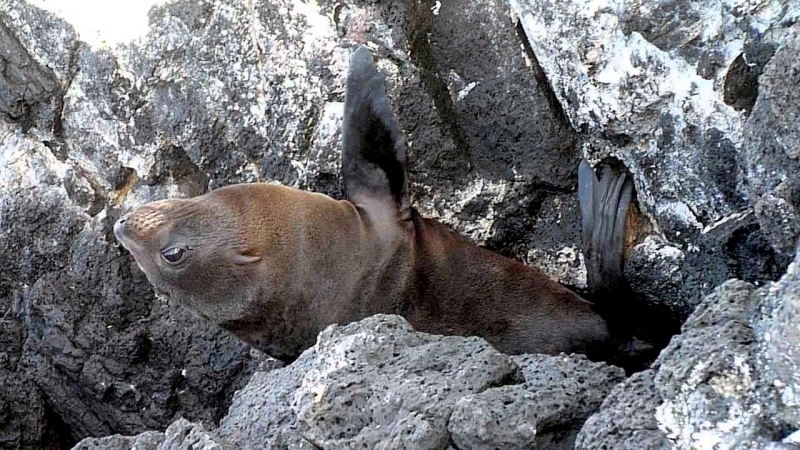 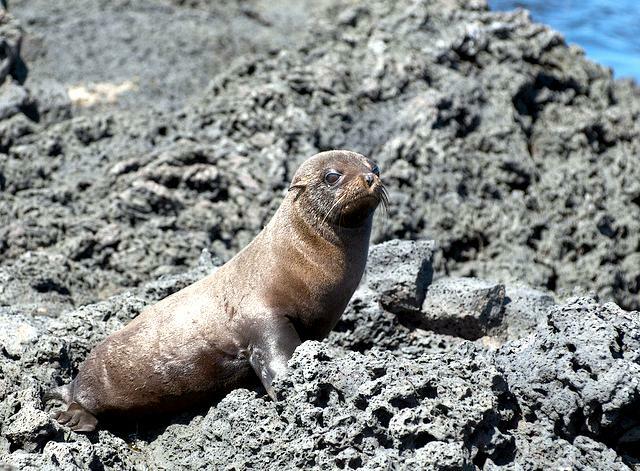 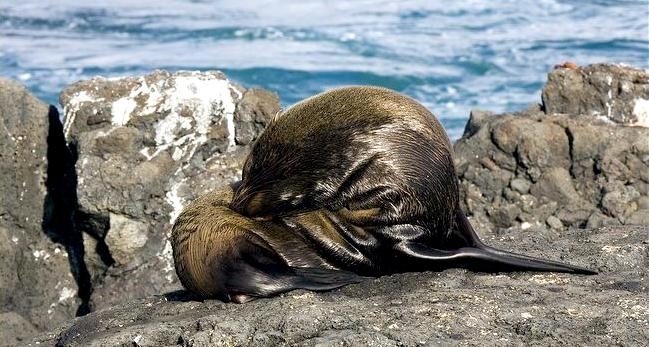 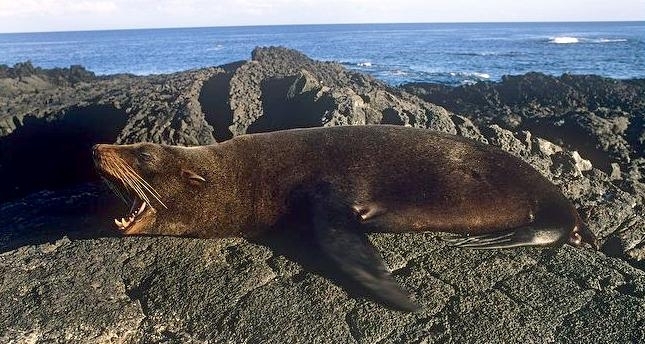 Unlike other seal species that prefer sandy beaches for their terrestrial habitat, the typical territory of a Galápagos Fur Seal consists rocky areas with shade for cooling. Galápagos Fur Seals must maintain an internal body temperature of about 37.7 °C, so they cool themselves in tide pools, a method of thermoregulation that females teach to their pups to keep them from overheating. 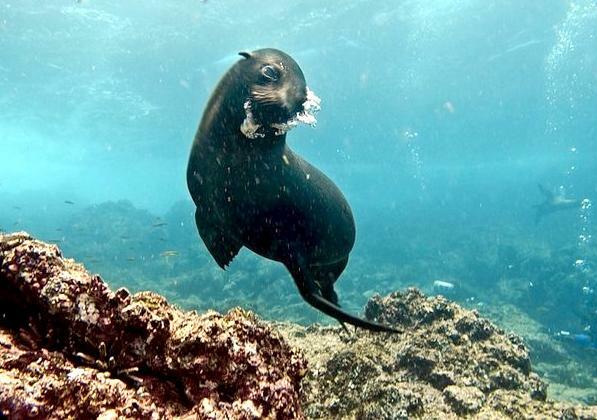 These seals also have a smaller body size to release heat quickly and they can also sweat, depending on their level of hydration. 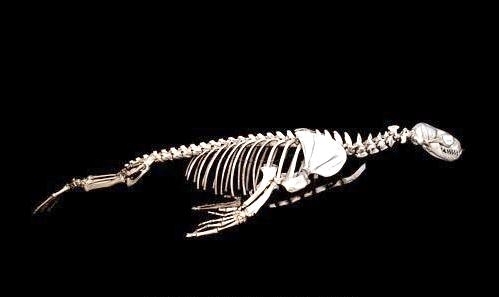 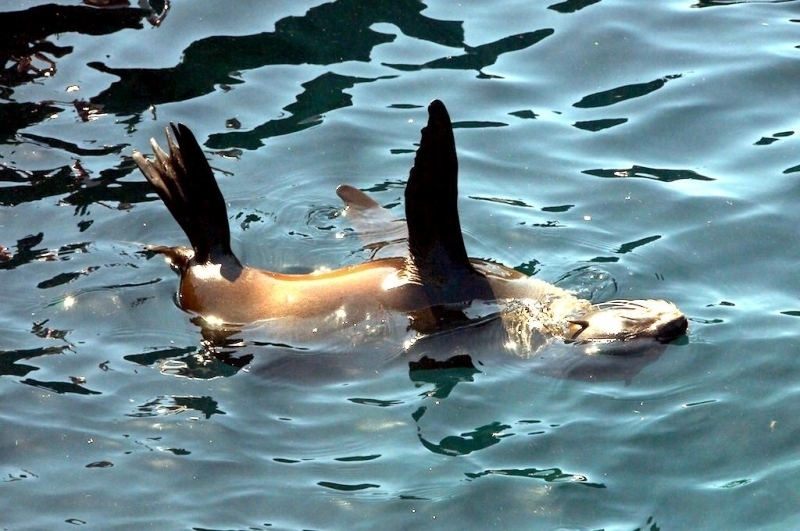 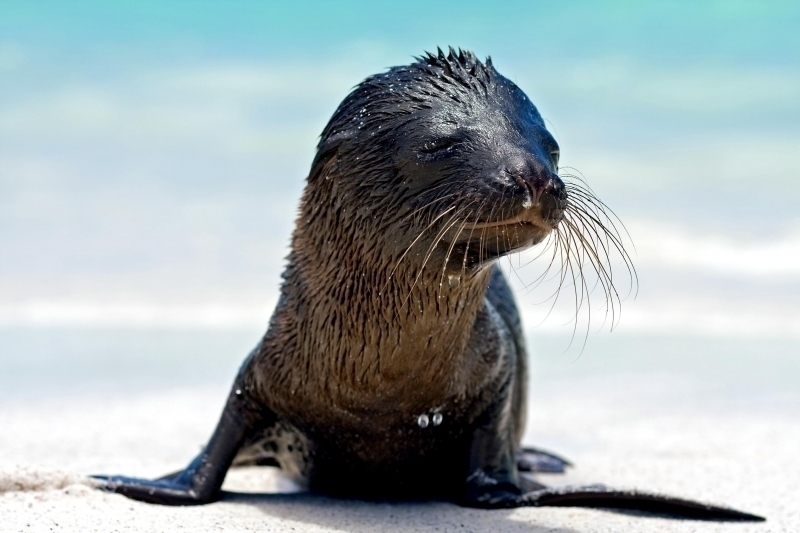 Thermoregulation is also controlled internally by the cardiovascular system by directing blood flow away from the flipper is the seal is too cold and toward the flippers if the seal is too warm. 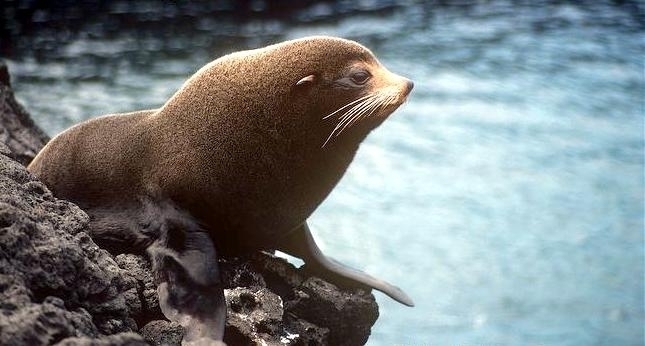 Galápagos Fur Seals are the smallest of the pinnipeds and live only around the Galápagos Islands. 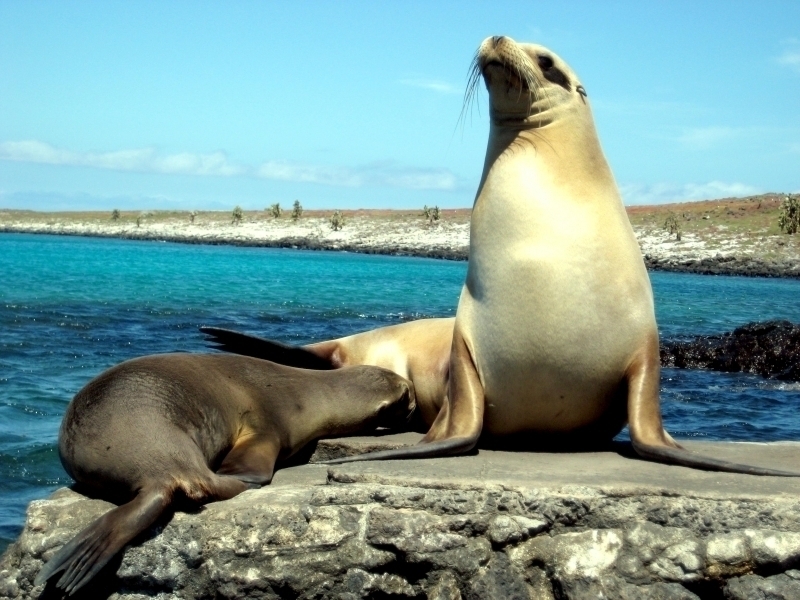 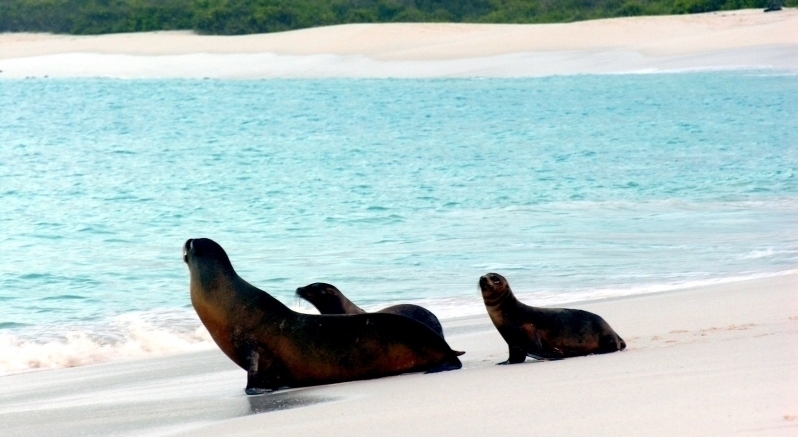 This species does not seem to share territory or food with the other pinniped species in the islands such as the Galápagos Sea Lion. 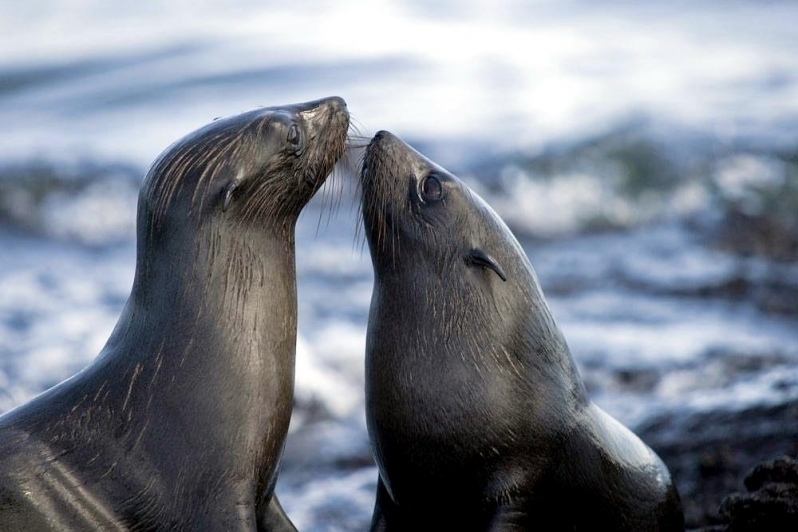 Galápagos Fur Seals feed on fish and cephalopods, close to shore and exclusively at night when their prey migrates closer to the surface. 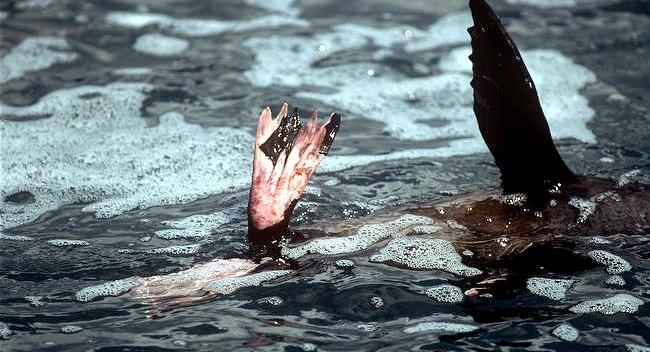 Sharks and Killer Whales are known to be predators but not to any great extent. 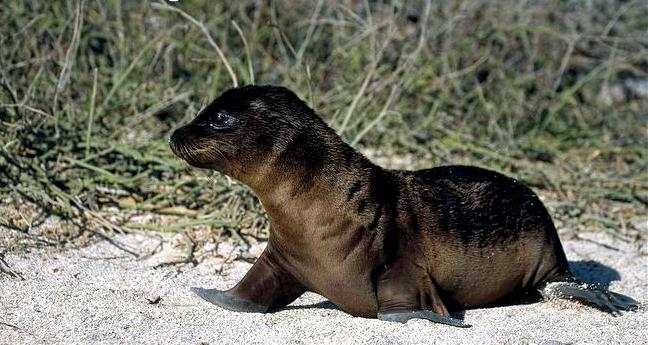 They have the longest pupping period of any pinniped. 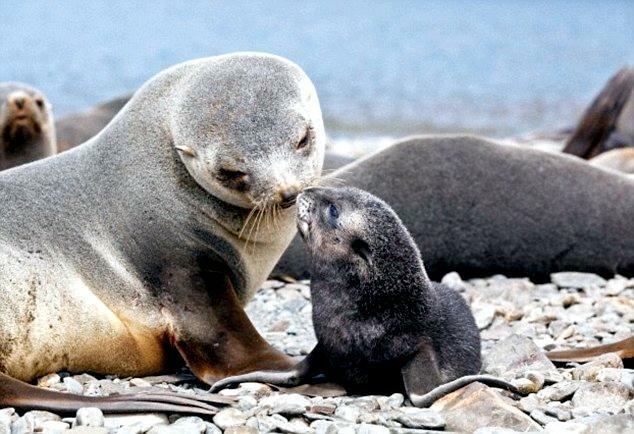 Pups are born between mid-August and mid-November. 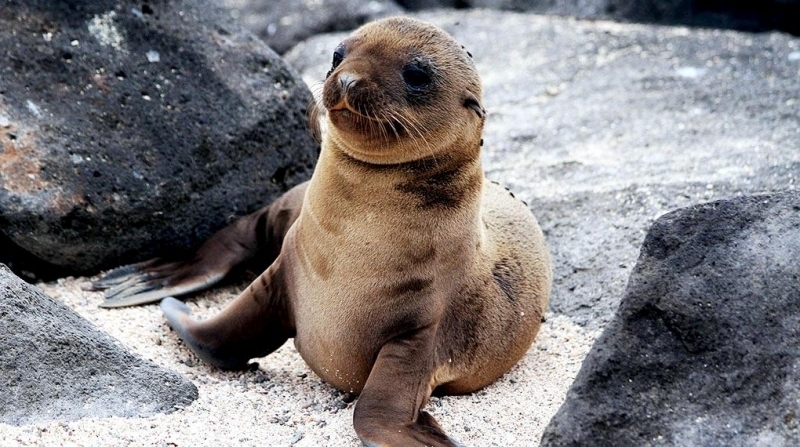 Pups weigh 3-4.5 kilograms at birth. 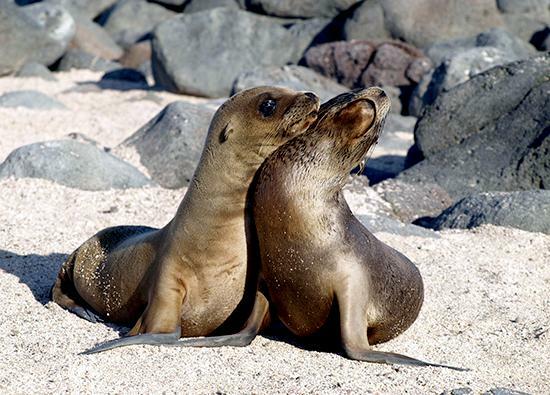 Females reach sexual maturity at 3-4 years, males around 7-10 years of age. 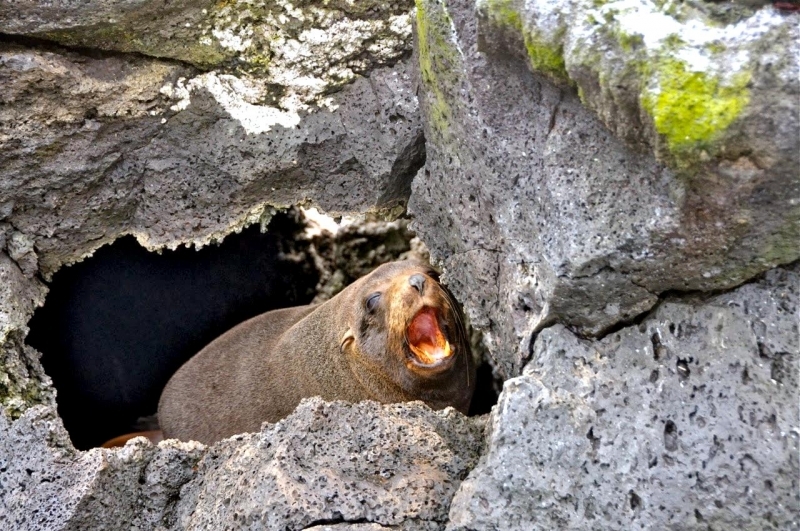 The preferred breeding habitat is rocky shores with sea caves on the western coasts of the islands. 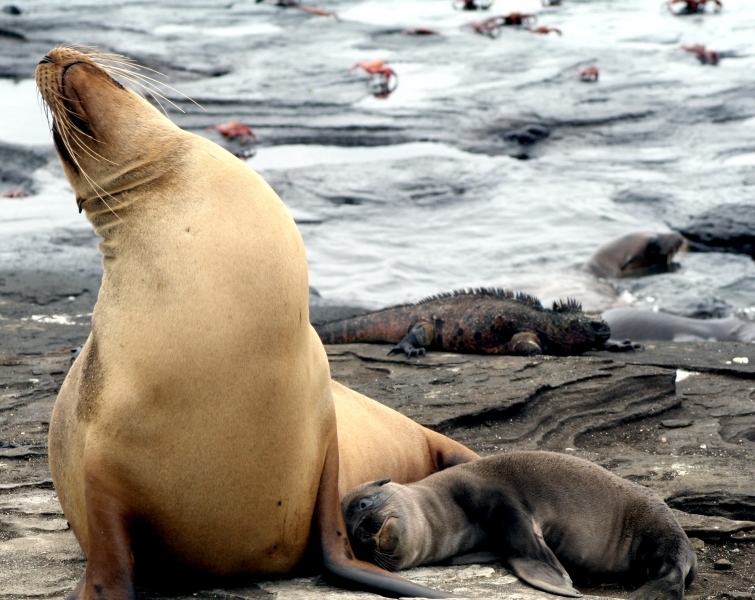 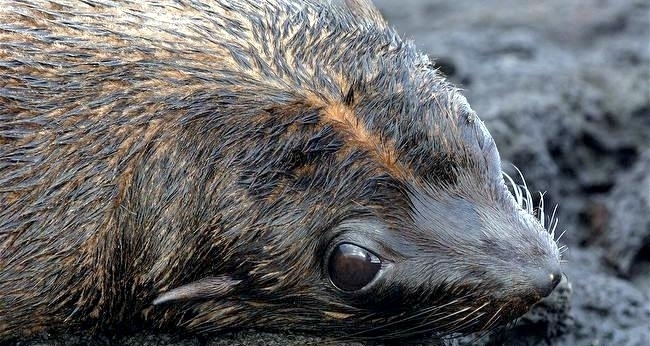 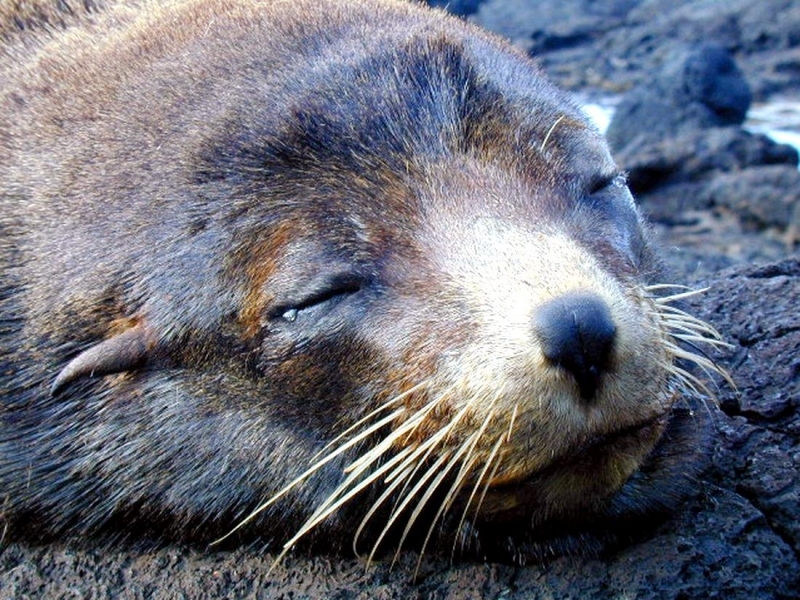 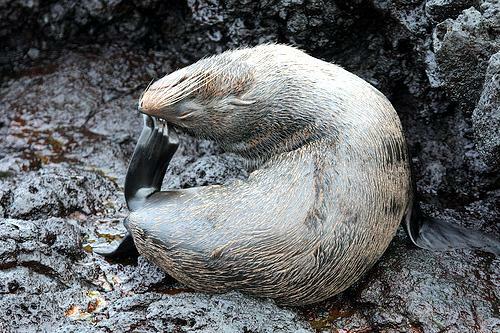 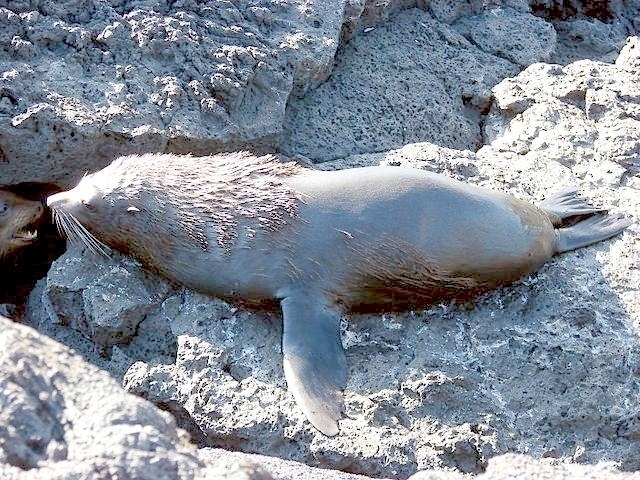 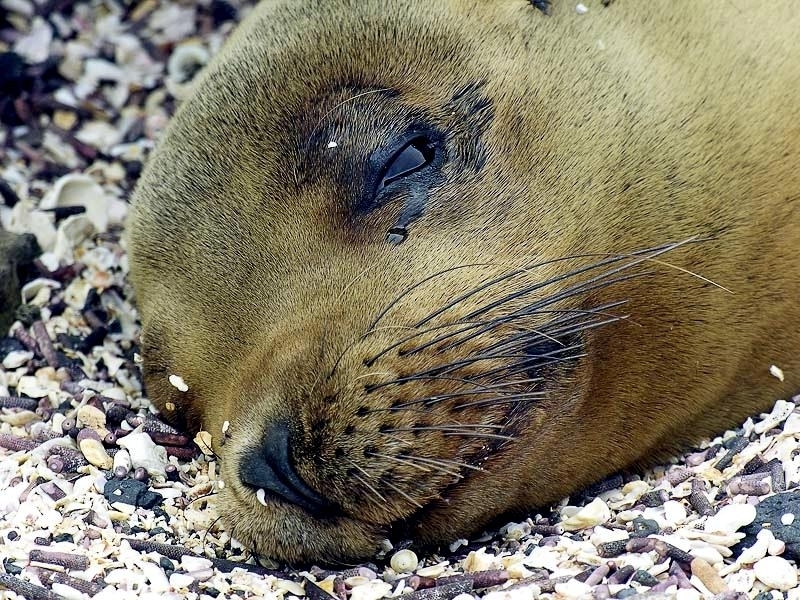 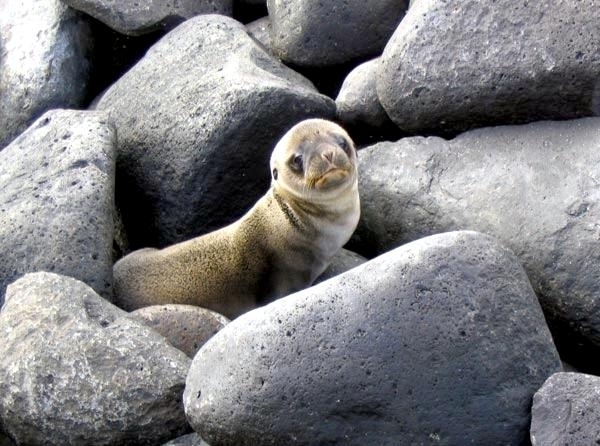 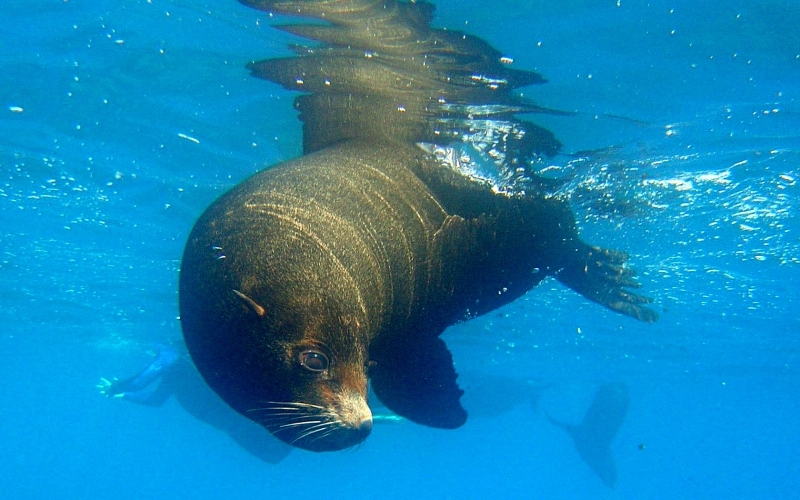 Female Galápagos Fur Seals give birth 2-3 days after coming ashore. 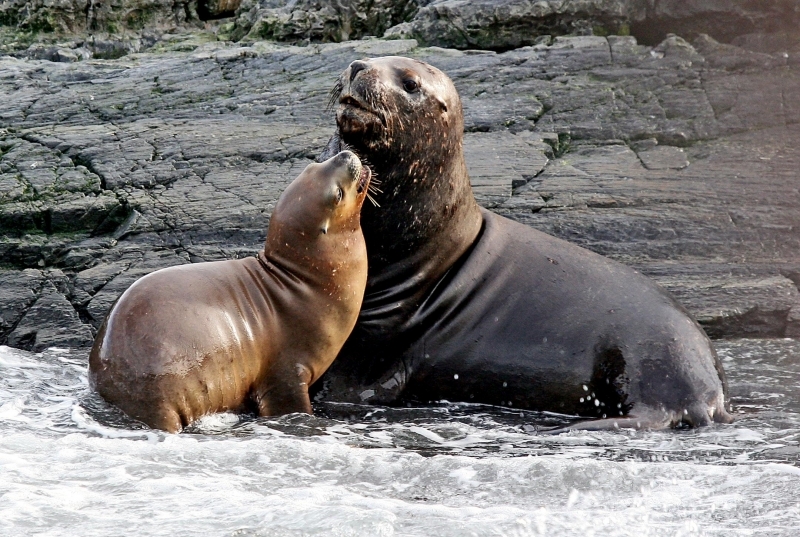 About 1 week after giving birth, females begin alternating between foraging for food in the water for 1-4 days and nursing for 1 day. 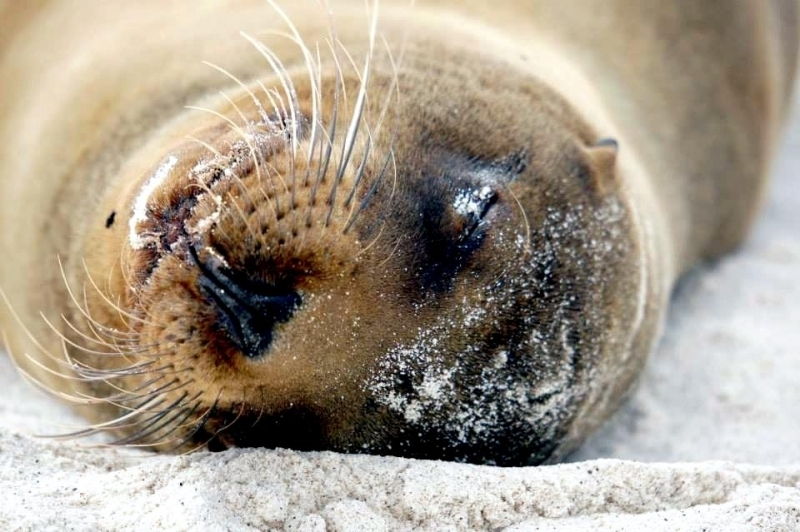 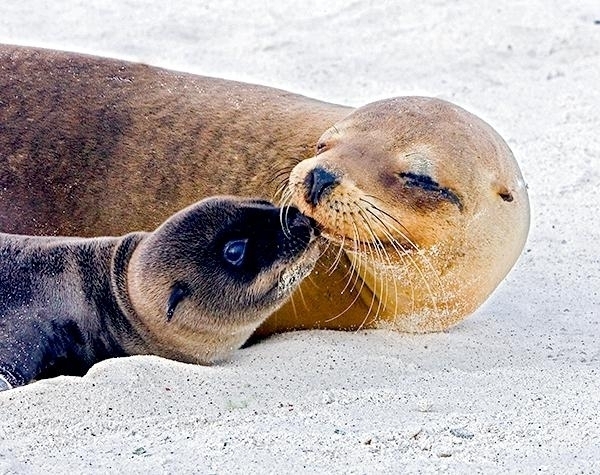 The duration of the nursing periods and the feeding trips appear to vary with the phase of the lunar month—mothers have been seen to spend 1.5-75 hours (average 22.5 hours) on shore feeding their pup and 3.5-127 hours (average 33.5 hours) feeding at sea. 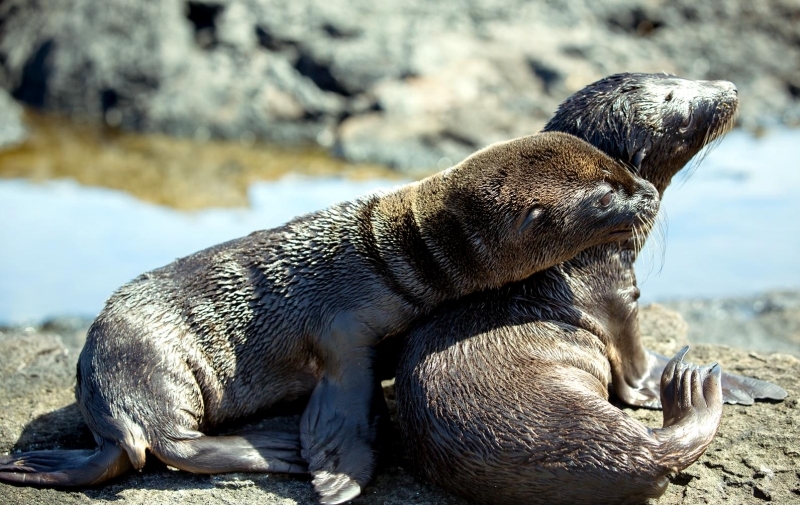 Observations have shown that the pups spend more time playing & moving around when their mother is away, although they have to take care since females can be quite ferocious towards pups that are not their own. 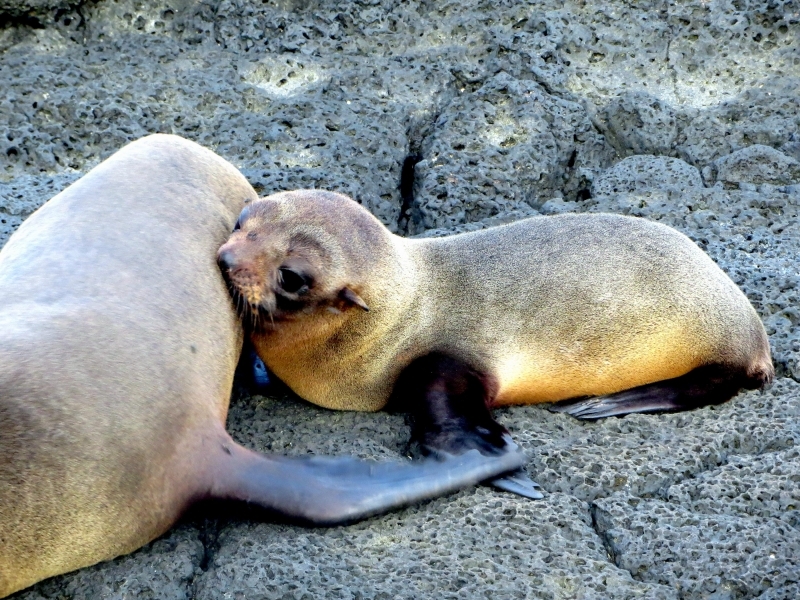 The female mates about 8 days after giving birth. 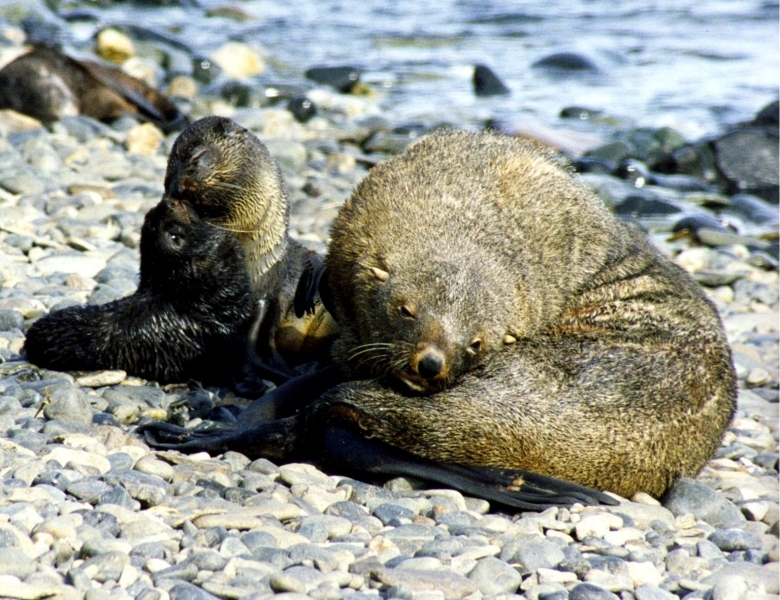 As with other fur seals, the males maintain breeding territories in this case for about 27 days at a time. 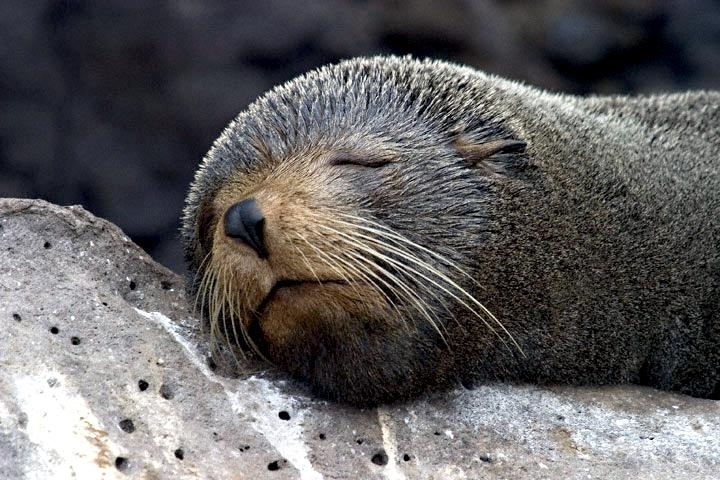 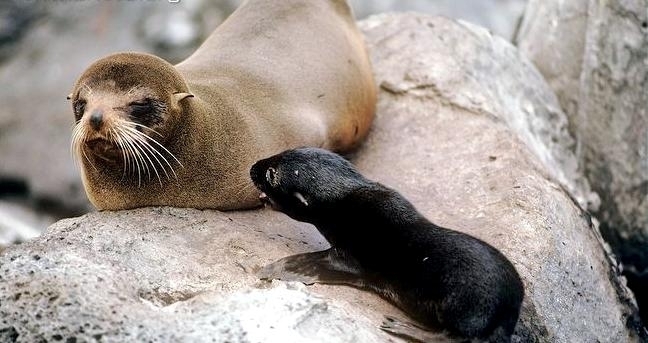 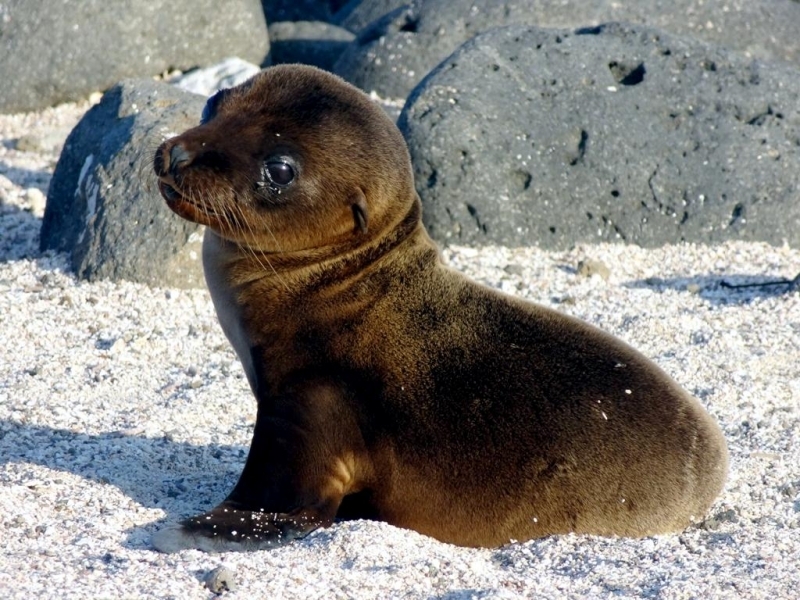 The Galápagos Fur Seal has the longest nursing period of any seal, the pups finally being weaned between 1-2 years but sometimes even being nursed at the age of 3 years. 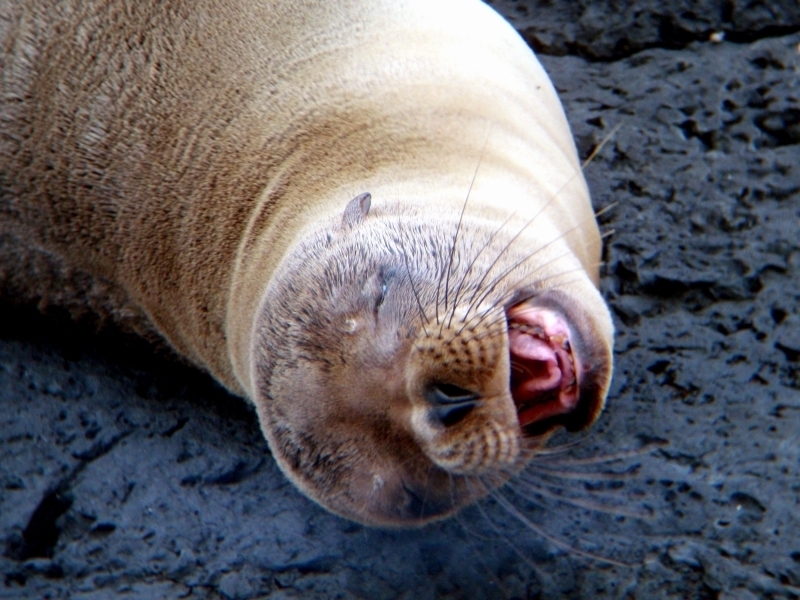 Only the Walrus has a nursing period close to this. 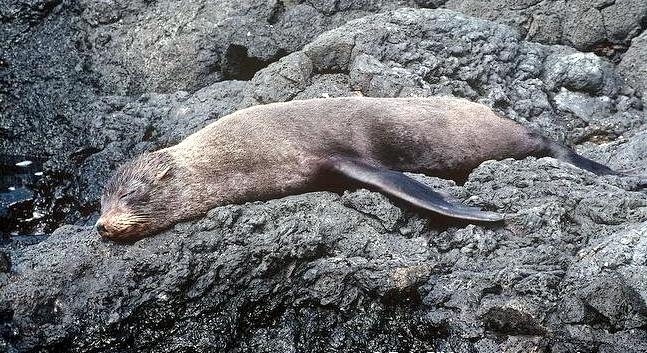 The nursing period of a particular pup tends to be longer if food has been scarce during the time of its nursing and the long period may therefore be a mechanism that the species has evolved to improve survival rates through such events. 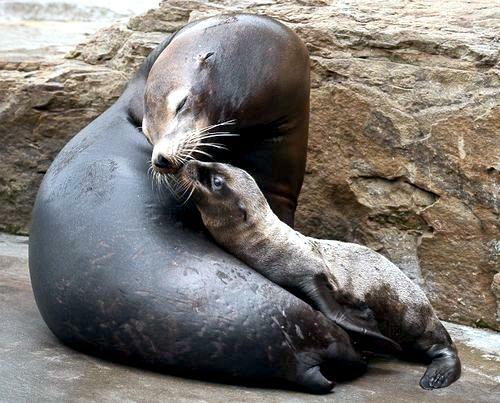 Pups begin to swim a little after a few months and start to engage in some independent feeding at 9-12 months. 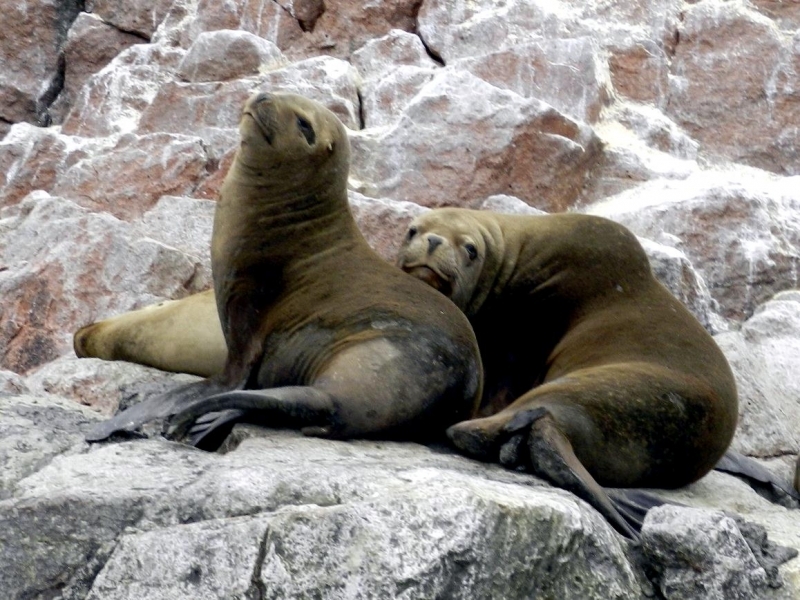 They molt into their grayish-brown adult fur at about 4 months. 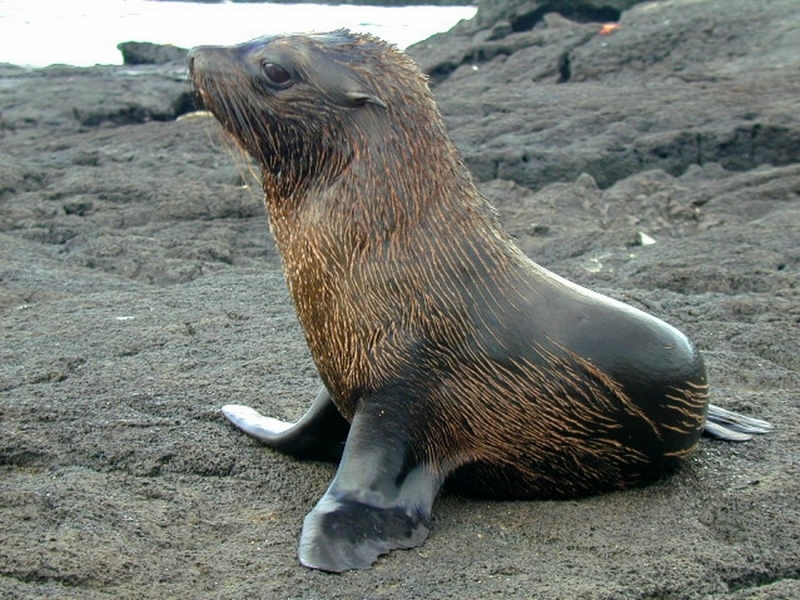 Galápagos Fur Seals do not migrate. 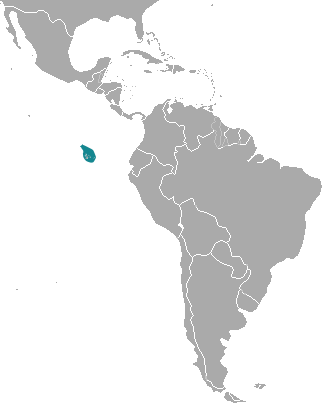 Current population size is estimated at about 10,000-15,000. 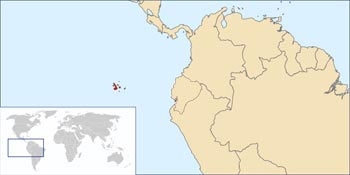 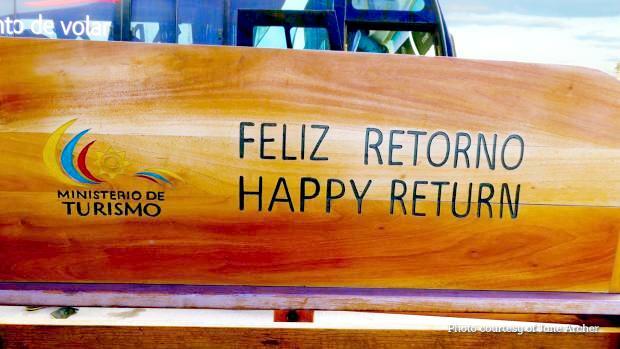 A former estimate of about 40,000 was based on a survey from 1978 and it is thought that the 1982-83 El Niño event significantly reduced the population.